Saturday morning. It is a warm australian winter morning in Saint-Denis, capital of Reunion Island in the Indian Ocean. From the avenue, a long line of white chairs leads through the garden, then into the modern art museum Leon Dierx. Following the line of chairs, one is led to two square paintings, each 2 by 2meters, almost monochrome golden works by local artist Alain Noël. On a 40cm high table, covered by a blue striped fabric, this artist is lying motionless, arms stretched out to the ceiling, clothed in a light green pyjama. To his right side, besides a small table covered with paints and papers and a book, the French/Swiss artist Nikunja is seated on a similar white chair, opposite a person, whose palms of the hands he is covering with paint. 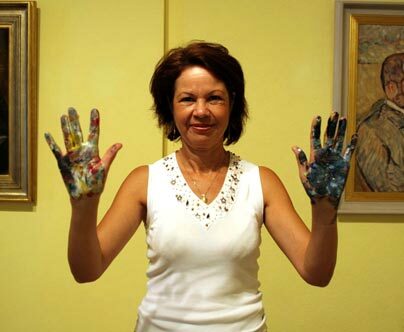 Then he imprints this paintings on a photograph, showing the situation of the artist lying in front of his paintings entitled Touch Me, Touch Me Not. The person is being guided by artist photographer Laurent Zitte to the motionless artist Noel, whose hands the participant is shaking, thus applying paint from his own hands to those of the artist. From there he is taken to the yellowish wall between two impressionist paintings, representing the famous french modern art collector Ambroise Vollard. His painted hands stretched out before him, his portrait is being taken. The newly created acrylic painting by Nikunja is being pinned to a red string, stretching throughout the hall of this part of the museum. 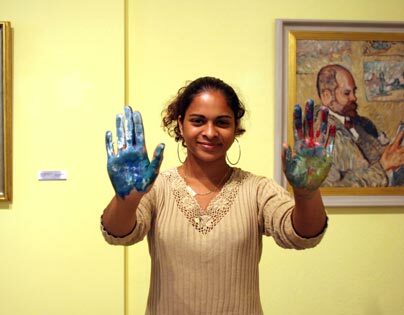 In the course of this Saturday and Sunday, Nikunja painted in this way the palms of 157 volunteer participants, visitors to the museum for the Journées Nationales du Patrimoine, organised by the French Cultural Ministery in the whole of France. 60 years ago, Vollard made a significant donation to this formerly colonial museum, of 157 art works by Picasso, Rouault, Cézanne, Gauguin, Bernard & many others, thus transforming it to a modern-art museum. This event was linked to the political emancipation of the local population, for it coincided with the departmentalisation of the Island, thus leaving the status of a colony and being given the authority of any French department. 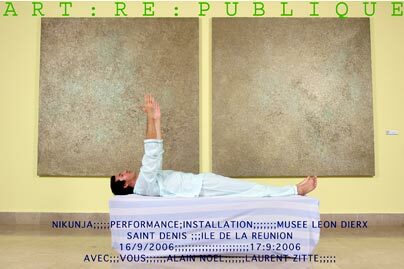 Nikunja, invited by the LEON DIERX Museum and artist Alain Noel, on this background created the interactive performance / installation entitled Art:Re:Publique, inviting the direct participation of the public and depending on it for its realisation. Each of the individual works was linked to the participating individuality and one oeuvre of the donation by Ambroise Vollard. 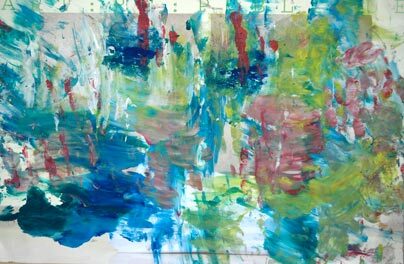 After a painting marathon of non stop work for 6 hours on Saturday and 7 hours on Sunday and the superb participation of the public – over 1500 visitors were counted – the 157 paintings had been created. The paintings together with the 157 photographs of the participants will constitute the final installation of a mosaic like carpet of paintings and photographs of 37 square meters, stretched out for two thirds on the wall and one third on the floor, mounted under glass. It will be presented to the public for the Journées Patrimoine 2007 at the Museum. Nikunja realised similar installation/performances of participated authority at the TENT., Contemporary art Centre of Rotterdam (2005), French Institute of Rotterdam (2005), University of Geneva (2001), UNESCO, Paris, Conference for 50th anniversary of the Human Rights Declaration (1998), United Nations of Geneva (1997).